Sea anemones have unique and complex relationships with certain types of bacteria. In daily life, bacteria is often presented in a negative light leading to infection, disease and sickness -- something to be avoided. But for the sea anemone, the right kinds of bacteria in the right places make all the difference when it comes to survival. Sea anemones are found in the taxonomic class, Anthozoa. Specifically, within this class of corals, sea fans and sea pens, they are the flower shaped, carnivorous, warm water dwelling polyps with several tentacles attached. Within these tentacles are nematocysts -- toxin projecting cells used to immobilize and capture prey. However, not all fish, bacteria, algae and other organisms are susceptible to this toxin. In fact, some have a mutually beneficial relationship with the sea anemone. Mutualism, such as the relationship found between sea anemones and some bacteria, is a form of symbiosis. This means that both the sea anemone and bacteria evolved together, essentially finding a use for each other as their environment changed over time. The sea anemone is considered the host while the bacterial organism, living on it, is a symbiont. As sea anemones are either slow moving or immobile, they need a permanent way to fend off predators and pathogens. 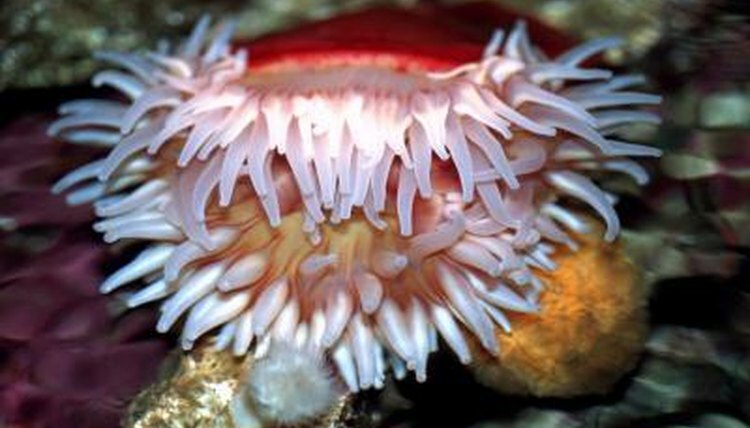 In addition, bacteria can use the help staying safe and well fed on anemone leftovers. In these relationships anemones have adapted genetically to possess specialized cells preventing certain bacteria from causing damage to them. More importantly, as studied in the Stichodactyla haddoni, anemone tissue develops microbial properties, fighting off various pathogens. In return, bacteria are able to feed on food particles leftover by the anemone and gain protection from predation themselves. The relationship between bacteria and sea anemones has far reaching implications, even in the human world. While the bacterial cells are moderately sensitive to some pathogens, when interacting with cells found in sea anemone tissue, sensitivity and effectiveness are greatly magnified. This information can help explain how healthy human gut bacteria works and what techniques need to be used to extract useful pathogen fighting bacterial cells from other organisms. Antimicrobial Activity of Tissue And Associated Bacteria From Benthic Sea Anemone Stichodactyla haddoni Against Microbial Pathogens.